My nose is really sensitive. So much so that my family teases me about it. I cannot stand the scent of most man-made chemicals. They trigger migraines for me. However, I love many natural scents! 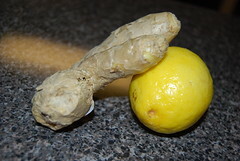 Ginger and lemon are some of my favorites. I also love many different spices: cinnamon, nutmeg, cloves. Vanilla and peppermint extracts are heavenly! Guess what? I also love these ingredients and you'll often see them in my cooking and baking. Mmmmm.... I need to bake something yummy soon. Those are some terrific smells. We've been making more indian dishes recently, and if I could I'd make the house smell like that all the time. All the wonderful spices.